Google Maps app update: New offline features let you navigate while offline. Plan ahead for trips where you won’t have data service. Maybe I’m the only one who’s gotten this irrational, but when my phone doesn’t have service, I find myself thinking completely illogical things like, “Since I don’t have service to check my email for the address, I’ll just look it up on Google Maps.” Nope. Still not gonna work. I get the sense that I might be in good company, though, because a new Google Maps app update for Android and iOS adds offline capabilities and custom map saving. Permission for my confused brain to do its thing. 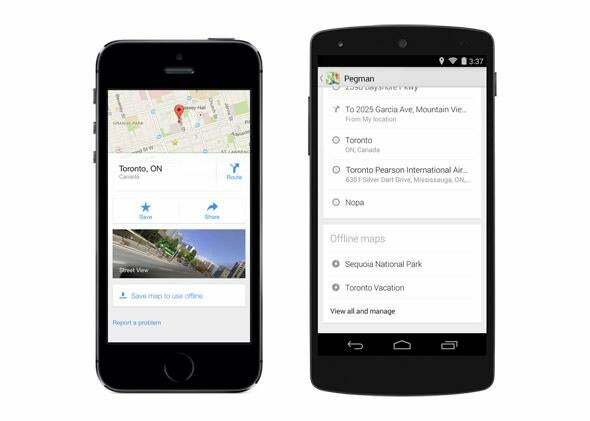 The Android Google Maps app has had some offline capabilities since last July, but now users can save map sections for offline access and can manage their saved maps more easily. iOS has also had a limited version of offline maps since last July, when Google added an Easter Egg that let iOS users save a map section by typing “OK maps” into the search bar. But now iOS has a full offline feature set and people will actually know about it, which is helpful. This update also adds lane guidance for driving and Uber integration so you can compare transportation costs or be taken straight to the Uber app. If you have the Uber app installed on your phone, you’ll see a “Get an Uber” option pop up along with other transportation suggestions. It’s a weird pairing, but as the Verge points out, Google Ventures does have $250 million invested in Uber. Offline capabilities are really useful for traveling, or even just saving maps of your local area in case you happen to be stuck in a building with lousy service. And though offline maps don’t actually resolve my tech neuroses, they might make them less noticeable. I’ll take it.